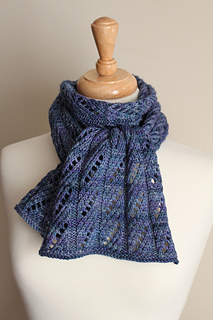 This is the first pattern in the Lacy Lady Collection. Other patterns include the Lacy Lady Shawlette and Lacy Lady Beret. 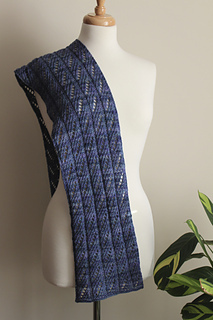 Each pattern may be purchased separately or all three may be purchased as an ebook set. Yardage: Approx 335 yards (one skein of Malabrigo Arroyo). Finished measurements: Approx 9 inches (23 cm) wide and 54 inches (137 cm) long, after blocking. Required skills: lace knitting (k2tog, yo, RT) and blocking. Blocking is required to open the lace pattern. A photo tutorial showing how to work the right twist (RT) stitch can be found online at leahmichelledesigns.com.